NORMAL — The conversation moves quickly down the right-field line 10 minutes after the Saturday evening baseball game is completed. Yet other than the occasional sound of hearty laughter, there is silence. The center of attention is the man in uniform standing on the playing surface. 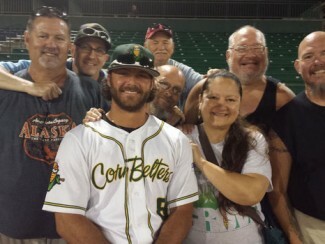 The others huddle around him in the first few rows of the Corn Crib’s section 101. 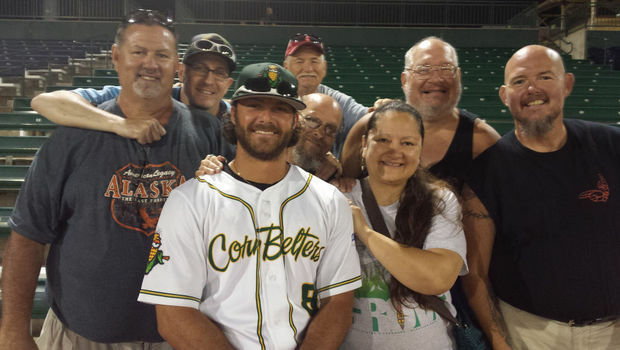 The man is Tommy Barksdale, former CornBelters’ player-turned-coach and ambassador. The group of seven has adopted No. 8 as their own. The hard-of-hearing Barksdale has embraced and become a unifying force in Bloomington-Normal’s deaf community. Barksdale considers himself “hard of hearing” because he is able to hear when wearing his Cochlear implant. He communicates with his deaf friends through sign language. “It’s nice to know there is a deaf community that supports me and watches my games and afterwards has a conversation with me,” said Barksdale. “It’s nice to be part of both worlds. I love it. They love it. Barksdale landed in Normal after Belters’ manager Brooks Carey received a call from an old friend, former Toronto Blue Jays manager Tim Johnson. “TJ called me from the California Winter League and said ‘Will you sign this kid I have out here?’ ” recalled Carey, whose team continues its pursuit of the Frontier League’s West Division championship Tuesday against Evansville in a 6:35 p.m. game at the Corn Crib. Barksdale made Normal’s season-opening roster but saw little playing time. Hitless in seven at-bats, Barksdale was nearly released several times when other personnel needs arose, according to Carey. On one occasion he planned to release Barksdale, he had several Belters’ veterans accompany Barksdale into his office to provide emotional support. “Three of them got tears in their eyes. I said ‘I don’t have any choice,’ ” Carey said. “I walk out the door and Tommy is sitting in center field in the dark, and Pat (McKenna) is down there with his arm around him. When Barksdale actually was cut from the active roster on July 13, Carey and team president Steve Malliet found a way to keep Barksdale in uniform. Although Barksdale still considers himself a player, he jumped at the opportunity to serve as bench coach and occasionally coach first base. Carey does have to remind Barksdale about the changes his new role has brought. “The kid is an inspiration to everybody here. He can be a little pain in the neck though,” said the third-year Normal manager with a big smile. “He still wants to take BP (batting practice) and do everything the rest of the players are doing. But he has a job now down in the batting cage. He’s got to throw BP. Carey has seen Barksdale treated no differently than anyone on the team.